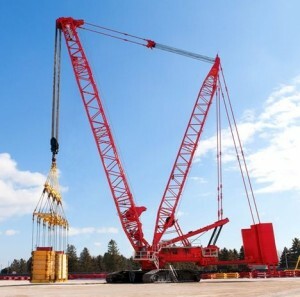 Manitowoc has completed the testing of its 650 tonne MLC650 crawler crane fitted with its variable position counterweight extension (VPC-MAX) attachment. Increasing the MLC650’s capacities from 650 to 700 tonnes, the VPX-MAX features additional counterweight and a beam that automatically extends the counterweight beyond the rear of the crane depending on the weight of the load. As part of the load testing the crane boom was positioned in a number of positions, including over one corner of the crane in order to apply the maximum level of stress through the structure. Manitowoc’s VPC-MAX attachment provides capacities similar to wagon/tray mounted attachments, but requires fewer components and assembly steps, which helps reduce setup times and transportation costs. The crane looks promising. It would have been nice to have information on the braking system.